God’s will for our lives is to seek His face always in every circumstance, every problem and every event of our lives. The face indicates very close intimacy and tender affection and love. It is more than a thirty second prayer or a devotional reading. This is diligent, daily, intense seeking God’s very face which reflects the beauty of His heart. We should seek God’s face with the intensity of Jacob. The Creator of the heavens and earth wants to talk to YOU, yes, you! God Almighty wants you to come into His presence and have an intimate conversation DAILY not just on Sundays. He is calling you to fellowship. He is calling you to intimacy! He is calling you into His manifest Presence. A Recent survey indicated that the average Christian spends 8 minute a day in prayer and the average minister 12 minutes a day in prayer. Are we too busy for God? How often do we practice His presence in a day? How often do we seek his face? Do you know God? Really know Him? Do you know the Lord Jesus? Really know Him? Do we experience God intimately on a personal level daily? When was the last time you sought his face? Tozer: How many Christians really harbor within their own spirit the daily expectation of God’ presence? How many truly expect a personal encounter with God? It is quite important to cultivate a daily expectation of God’s presence in your day. Jeremiah 29:13 admonishes us, “And ye shall seek me, and find me, when ye shall search for me with all your heart.” Proverbs 8:17 states, “I love them that love me, and those that seek me early shall find me.” Each day presents a new opportunity to experience God and fellowship with Him. Nothing should so occupy the mind of the Christian than discovering God in his day. My encounter with God today may be of such a nature as to alter the course of my life. With a sacred expectation for me to dwell upon each morning, as I get up, I look for God in all the circumstances of my day. Tozer: Man unlike any other of God’s creation, is uniquely created to experience God. Not to know God and His intimacy is to deny our fundamental purpose. The human race has been guilty of revolt. Men have broken with God, and the Bible teaches that we are all alienated from Him. That is, we-the human race-are strangers to Him. We have ceased to love Him, ceased to trust Him and ceased to enjoy His presence. Redemption simply brings us back intimate fellowship with God. We must learn to live again in that presence-the manifest, conscious presence of God. Psalm 14:2 The LORD looks down from heaven on all mankind to see if there are any who understand, any who seek God. Psalm 10:4: In his pride the wicked man does not seek him; in all his thoughts there is no room for God. Who is this generation truly seeks Yahweh? Who in our age really seeks God’s face? The wicked has no room in their thoughts for God. Do we want all of God? Have we created a god in our own image? Is God our most treasured possession? We need to breathe in God’s presence daily. Live in the conscious, vital, living presence of God. Practice the art and discipline of living in His presence every moment and our lives will be radically transformed. Tenney: Words whispered from the pillow of royal intimacy with the King can literally rearrange your future. We shape our destiny by the decisions we make every day. Through worship, prayer and intimate relationship with the Lord, you can change your destiny and the destinies of your family, cities, nations and the world. God said” Come let us reason together” in Isaiah. Speak to God from the place of intimacy and let him rearrange your future. Amos 5:4: For thus saith the LORD unto the house of Israel, Seek ye me, and ye shall live. Deuteronomy 4:29: But if from there you seek the Lord your God, you will find him if you seek him with all your heart and with all your soul. The fire of desire for God comes from communion with Him, and this always begins with discipline. We must set our wills, our minds, and our emotions every day to seek Him. As we continue to seek Him and His power, the longing for greater fellowship begins to grow. Desire and discipline work hand-in-hand. “The Lord would speak to Moses face to face, as a man speaks with his friend” (Exodus 33:11). How did he meet with the Lord? We read that “Moses used to take the tent and pitch it outside the camp, a good distance from the camp, and he called it the tent of meeting. And it came about, that everyone who sought the Lord would go out to the tent of meeting which was outside the camp. Did you notice where “everyone” who sought the Lord went? It tells us three times that it was outside the camp. Jesus went up to a mountain to pray. We need times of solitude away from everything to seek His face. II Chronicles 7:14 (NKJV): if My people who are called by My name will humble themselves, and pray and seek My face, and turn from their wicked ways, then I will hear from heaven, and will forgive their sin and heal their land. This is an unusual command. a. It is not a seeking of His hand. b. It is not a seeking of His blessings. c. It is a seeking of Him, His Presence, just Him. Have you ever come to God to just thank Him, praise Him, worship Him, love Him, treasure Him and behold Him without a grocery list of requests? This is seeking His face! WHY. . SEEK HIS FACE? 1. Seek His Face because of Who He is; 2. Seek His Face Because of What He did; 3. Seek His Face Because of What He does; 4. Seek His Face Because of Where He is. If I Seek The Face of God, I will seek His . . Eyes. 1. Seek His Eyes and . . Find Grace. Gen 6:7-8 But Noah found grace in the eyes of the Lord. 2. Seek His Eyes and . . Do Right. Deuteronomy 13:18: because you have listened to the voice of the Lord your God, to keep all His commandments which I command you today, to do what is right in the eyes of the Lord your God. 1 Peter 3:12: For the eyes of the Lord are on the righteous, And His ears are open to their prayers; But the face of the Lord is against those who do evil.” Psalm 32:8 speaks of God guiding us with His eyes. The only way to be able to see God guiding us with His eyes is to look at His face.Psalms 32:8: I will instruct you and teach you in the way you should go; I will guide you with My eye. LORD HELP ME SEEK YOUR FACE AND SEE AS YOU SEE! B. 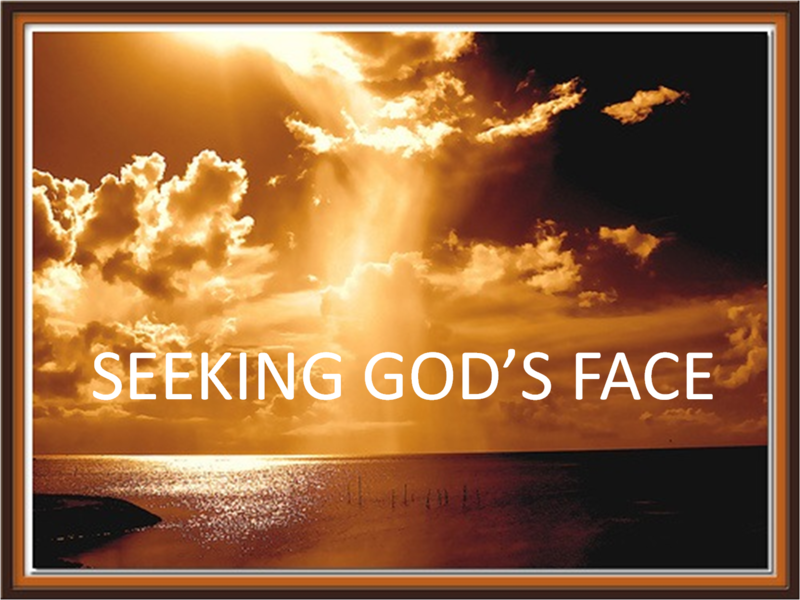 If I Seek The Face of God, I will seek His . . Ears. saved him out of all his troubles. When . . Do I Seek His Face? Ps 63:1 God, You are my God; Early will I seek You; My soul thirsts for You; My flesh longs for You In a dry and thirsty land Where there is no water. 1 As the deer pants for the water brooks, So pants my soul for You, O God. 2 My soul thirsts for God, for the living God. Have we set our heart to seek the Lord? King Rehoboam fell into all type of evil; his whole life was evil because he did not set his heart to seek God. The very nature of God demands we set our heart to seek Him. God commands it. If we do not prepare our hearts to seek the Lord then sin which is always crouching at the door of our heart will control our lives. Daniel 9:3,7,8:And I set my face unto the Lord God, to seek by prayer and supplications, with fasting, and sackcloth, and ashes: 7 O Lord, righteousness belongeth unto thee, but unto us confusion of faces, as at this day; to the men of Judah, and to the inhabitants of Jerusalem, and unto all Israel, that are near, and that are far off, through all the countries whither thou hast driven them, because of their trespass that they have trespassed against thee.8 O Lord, to us belongeth confusion of face, to our kings, to our princes, and to our fathers, because we have sinned against thee.19 O Lord, hear! O Lord, forgive! O Lord, give heed and act! Do not delay, for Your own sake, O my God, because Your city and Your people are called by Your name.20 While I was speaking and praying, confessing my sin and the sin of my people Israel, and presenting my supplication before the Lord my God for the holy hill of my God—Yes, while I was speaking in prayer, the man Gabriel, whom I had seen in the former vision, being caused to fly swiftly, came near to me and touched me about the time of the evening sacrifice.22 He instructed me and made me understand; he talked with me and said, O Daniel, I am now come forth to give you skill and wisdom and understanding.23 At the beginning of your prayers, the word [giving an answer] went forth, and I have come to tell you, for you are greatly beloved. Therefore consider the matter and understand the vision. We live in a generation of confusion of faces. We have turned our face to everything but God. Our sin causes us to turn our face away from God to another. Look at Daniel’s heart! As He confessed His sin and the sin of His people and sought God’s face-the archangel Gabriel came to him and gave him skill, wisdom and understanding and the word went forth from heaven that he was greatly beloved. Nothing delights God more than when we seek His face. To seek God’s face we must break to pieces, demolish and purge all idols in our hearts. II Chronicles 34:3-5For in the eighth year of his reign, while he was yet young [sixteen], he began to seek after and yearn for the God of David his father [forefather]; and in the twelfth year he began to purge Judah and Jerusalem of the high places, the Asherim, and the carved and molten images.4 They broke down the altars of the Baals in his presence; the sun-images that were high above them he hewed down; the Asherim and the graven images and the molten images he broke in pieces and made dust of them and strewed it upon the graves of those who sacrificed to them.5 Josiah burned the bones of the [idolatrous] priests upon their altars, and so cleansed Judah and Jerusalem. The Devil wants us to seek his face and turn our eyes to his idols. So often in Scripture God says His people turned their eyes to idols which mean they turned their face to the idol. We seek the Devil’s face when we seek the face of the world, the face of our flesh and the face of our sins. Isaiah 65:1-4 NLT: The Lord says, “I was ready to respond, but no one asked for help. I was ready to be found, but no one was looking for me. I said, ‘Here I am, here I am!’ to a nation that did not call on my name.All day long I opened my arms to a rebellious people. But they follow their own evil paths and their own crooked schemes.All day long they insult me to my face by worshiping idols in their sacred gardens. They burn incense on pagan altars. Amazing that God cries out daily: “Here I am! Here I am!” and no one is looking for him. Exodus 33:11a The LORD would speak to Moses face to face, as one speaks to a friend. Do have the intimacy with God that Moses had? We are God’s sons or daughters. O how greater our intimacy should be! Psalm 63:1,6: NKJV: O God, You are my God; Early will I seek You; My soul thirsts for You; My flesh longs for You In a dry and thirsty land Where there is no water. When I remember You on my bed, I meditate on You in the night watches. We seek God early first before we seek the newspaper, television or even our breakfast and we seek God at night when we close our day as we mediate upon His words, his greatness and His love. I met God in the morning, When my day was at its best, And His presence came like sunrise, Like a glory in my breast. All day long the presence lingered; All day long He stayed with me; And we sailed in perfect calmness, O’er a very troubled sea. Other ships were blown and battered, Other ships were sore distressed, But the winds that seemed to drive them, Brought to us a peace and rest. Then I thought of other mornings, With a keen remorse of mind, When I too had loosed the moorings, With the Presence left behind. So I think I know the secret, Learned from many a troubled way; You must seek Him in the morning, If you want Him through the day. Dr. Tozer said as a mature man in his sixties that there were times when he lay on the rug for an hour, two hours, three hours, four hours and never uttered a word of prayer, and never uttered a word of praise. He said, “I’m lost in adoration, I see Him in His glory, in His majesty, in His beauty. I can hear those holy beings crying, ‘Holy, Holy, Holy is the Lord.’” And he said, “I’m silent in adoration before Him. I had no language, it is beggared.” And he had a vocabulary as good as any man I know, and he had read more of the mystics, I think, than any man I know, and he had some of the closest encounters to God of any man I know. Tozer: When a Christian breaks the religious routine and experiences God’s presence for the very first time, he no longer wishes to go back. He has found something so utterly satisfying that he loses his former attraction to the world and the things around him. The Holy of Holies in the Temple was the place of the literal presence or face of God. A veil separated the Holy of Holies from the people. The people could not enter into the holy of holies. The veil was there to shut out the unqualified from the holy face of God. The veil was heavy and it took some men to push it aside. Inside the holy of holies was the ark of the covenant and on the lid of the ark there were two cherubim of pure gold with the stretched wings and their wingtips touched. 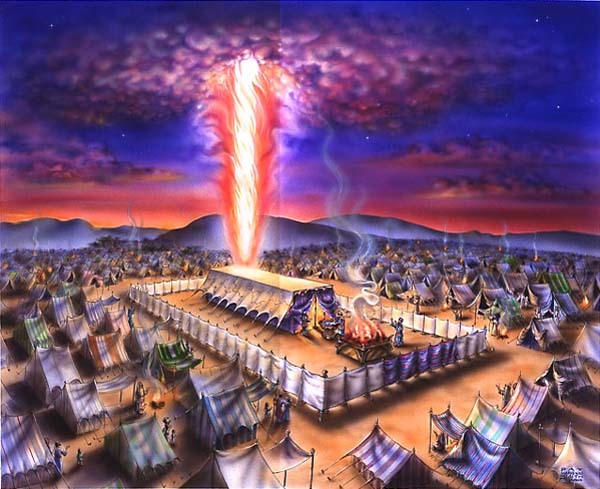 Between the wingtips burned and glowed the awesome holy fire, which the sages called the “Shekinah” meaning the “presence” or the “face.” This was the very presence, face and glory of Yahweh . Arnold Fruchtenbaum defines Shechinah Glory as…. the visible manifestation of the presence of God. It is the majestic presence or manifestation of God in which He descended to dwell among men. Whenever the invisible God becomes visible, and whenever the omnipresence of God is localized, this is the Shechinah Glory. The usual title found in the Scriptures for the Shechinah Glory is: the glory of the Lord. God wants to dwell in and with you so that we are always face to face with our loving, caring God. Enjoying His presence! Enjoying the wonders of our God! Psalm 16 says that in God’s presence or face is fullness of joy and pleasures forevermore. Our lives will overflow with joy when practicing His presence is the primary habit of our lives. We will shine to the world even greater than Moses shone when we spend time in God’s presence daily. Our faces will reflect and burst forth with His glory. Jesus Christ by His death on the cross and resurrection tore the veil from top to bottom that separated the people from the Holy of Holies and opened the way to you to enter so now you can be in the literal manifest presence of God, face to face, daily. The Shekinah glory of God, now dwells with us and God has made our bodies the new Holy of Holies. We can enter and draw near to God with confidence and boldness and humility into the holy place of His presence by the blood of Jesus and behold and seek His face every moment of the day. No veil separates us. Nothing can keep us or separate us from our God and this great work of Christ mandates we choose to seek His face daily and see His glory daily in close intimacy. Hebrews 10:19-22Therefore, brethren, since we have confidence to enter the holy place by the blood of Jesus, 20 by a new and living way which He inaugurated for us through the veil, that is, His flesh, 21 and since we have a great priest over the house of God, 22 let us draw near with a sincere heart in full assurance of faith, having our hearts sprinkled clean from an evil conscience and our bodies washed with pure water. Hebrews 4:14-1614 Therefore, since we have a great high priest who has ascended into heaven, Jesus the Son of God, let us hold firmly to the faith we profess. 15 For we do not have a high priest who is unable to empathize with our weaknesses, but we have one who has been tempted in every way, just as we are—yet he did not sin. 16 Let us then approach God’s throne of grace with confidence, so that we may receive mercy and find grace to help us in our time of need. There is a difference between a presence and a manifest presence. If a man comes into the room and keeps his back turned to you, you can say I was in his presence for an hour. But you do not have much fellowship with a man who keeps his back turned to you. It is when he turns his face to you that fellowship begins. This is the difference between God being present and God’s face being manifest to His people. God’s presence is everywhere but God’s face-God’s realized, vital, manifest, enjoyed presence is the precious treasure of God’s people. Unfortunately many Christians settle for less than God’s conscious manifest presence in their daily walk. There is a strain of loneliness that only the presence of God can cure. Once a person experiences the conscious, manifest presence of God, he or she will lose interest in everything else in the world. No longer will the cheap chorus satisfy. The flood of entertainment that has swamped the Church will leave him with a desperately empty feeling inside. He has discovered something far greater in God’s presence. Tozer: We must discipline ourselves to come to the Word with holy anticipation to meet with God. Discipline ourselves to read the Bible until it comes alive-until we can almost feel the breath of God breathing on us. Tozer: Another discipline toward the daily practice of God’s presence is the discipline of solitude. We live in a very noisy world. All around us are noises and voices that are most distracting. Everything in our life and the world around us mitigates against solitude. What could be more important than sitting in silence before God. Many times when we come to God in prayer, we come with a grocery list of things we are asking for. I believe in asking God for things. I believe it is important to come before God with a list of things that we are trusting him for. But after all that is done, some time must be given to cultivating silence before His presence. “Surely the arm of the LORD is not too short to save, nor his ear too dull to hear. But your iniquities have separated you from your God; your sins have hidden hid face from you, so that he will not hear.” (Is. 59:1-2). Unconfessed and unrepentant sin separates us from the face of God. We must constantly examine our hearts for idols, fear, unbelief, worry and confess these sins and let God cleanse our hearts so we might seek His face. Intimacy with God begins when we radically pursue Him with our whole heart. King David wrote, “When You said, ‘Seek My face,’ my heart said to You, ‘Your face, O Lord, I shall seek’” (Psalm 27:8). God invites us in James 4:8 to “Draw near to God and He will draw near to you.” We are instructed in Psalm 46:10 to “Be still, and know that I am God.” The wording “be still” literally means to cease from striving. It means to let go and relax, to turn down the volume of the world and listen to the quiet whisper of God. It’s getting still and coming into a place of rest. It means “soaking” in His Presence. The result is that you will know He is God. There remains therefore a rest for the people of God (Hebrews 4). Bible reading and prayer are not enough. We must take time alone with Him, not asking for anything but more of Him, more of His fullness, more of His Presence in our everyday lives. Oates: I’m often asked, “What do you do in your time of seeking His Presence?” I don’t have a set formula. In my life, it varies from time to time, but the basic components are as follows: First, I go into a private room, lock the door, and get on the floor before the Lord. It doesn’t matter whether you sit or lie down. What’s most important is the attitude of your heart. Second, I repent of any sin in my life and I receive God’s forgiveness. Third, I worship the Lord in both my native language (English) and in the language of the Holy Spirit. Fourth, I do the vital prayer of Romans 6:13 that has transformed my life: “…present yourselves to God as being alive from the dead, and your members as instruments of righteousness to God.” Fifth, I begin to recall experiences with the Lord (i.e., healings, miracles, provision) where He has manifested Himself in wonderful ways. This creates more of an expectancy and awareness of His Presence as I relive these times. I tell the Lord: “God, I want more of You, more of Your Presence, more of Your fullness in my life. Fill me with more of You.” I may repeat this statement many times as I wait on the Lord and focus on Him. Then, I get quiet and that’s when I begin to hear His voice. The key here is learning to wait in solitude. I cannot overemphasize the importance of waiting on the Lord until I experience His manifest Presence daily. I don’t come out of that private room until I have experienced His Presence. We must learn to come quietly into His Presence just wanting more of Him in our lives. We need to “soak in His Presence,” extracting more of His fullness into those places where we are barren. The cumulative effect of spending time with the Lord will produce an increased anointing in your life. The release of that anointing will serve as a springboard to a life of miracles. The apostle John offers Believers a mind-boggling statement in 1 John 4:17 (NASB): “…as He is, so also are we in this world.” The implication of this verse is clear – Believers should be like Him. That is next to impossible without spending quality time in His manifest Presence. We will never even understand His compassionate nature for a lost and wounded humanity without regular, daily times with Him. What is meant by “diligently seek Him”? To “seek” God is to forsake, deny, go out of self, and take Him alone for our Ruler and satisfying Portion. To seek Him “diligently” is to seek Him early (Pr 8:17), whole-heartedly (Ps 119:10), earnestly (Ps. 27:4), unweariedly (Luke 11:8). How does a thirsty man seek water? If we are not careful, we can become so consumed with serving the ministry God gave us and forget the Lord Himself. This is why He cries out to them (paraphrase),“Repent and return to your first love. Then continue with the ministry I have given you. Minister because you love Me. Whatever you do, do it as unto Me.” How is it that, even in ministry, we can lose our first love? It all begins when we neglect to come into His presence and sit at His feet. It is in His presence that we grow in our understanding of Him and His ways, and are equipped to go and carry out the ministry He gave us to do. Our lives take on the atmosphere of living moment by moment waiting, listening for His voice and being sensitive to Him, seekingto do what He desires. KP Yohannon: Why is it so critical for us to continually take the time to wait upon Him and hear from Him, drawing close and living in His presence? Because when we do not, we are walking in sin. You see, there are two types of sin that we need to be mindful of. One is the sin of rebellion—we refuse to wait to know what the Master’s will is and do what we want to do with an independent, rebellious spirit, void of brokenness and humility. The second is the sin of presumption. This is where we run ahead with our own plans and in our own understanding, never taking the time to hear what He desires or to find out His ways. The prevention to each of these sins is found in waiting upon the Lord. You see, by choosing to come into His presence, we leave aside our agenda and prepare ourselves to submit to His yoke. In His presence we are changed; the independent spirit is substituted for His will and His ways. Our hearts change as a deep transformation takes place within. Yet it never happens overnight. This process of continually changing and becoming like the Lord only takes place as we take the time to be with Him, to sit at His feet and to gaze upon Him (see 2 Corinthians3:18).It is in these times that we are emptied of ourselves and become one with Christ. Job 5:8: I would seek unto God and unto God would I commit my cause. To have intimate communion we must come out from the world and be separate and not intertwine our lives with the unbeliever, the world and the ways of the flesh. Tozer: Let me give personal testimony that I never anticipate a day without experiencing the presence of God. Start the day seeking God’s presence and search for Him all through the day and revel in the gracious encounters of God throughout the day. for Him, will we be people fully equipped for every good work, able to carry out the ministry He gave us to do. Psalm 40:16 KJV: Let all those that seek thee rejoice and be glad in thee: let such as love thy salvation say continually, The LORD be magnified. Psalm 105:1-4 NKJV: Oh, give thanks to the Lord! Call upon His name; Make known His deeds among the peoples!2 Sing to Him, sing psalms to Him; Talk of all His wondrous works! 3 Glory in His holy name; Let the hearts of those rejoice who seek the Lord! 4 Seek the Lord and His strength; Seek His face evermore! May we pledge to God from this day forward to seek His face forevermore where in His presence you magnify the Lord daily and are exceeding glad and joyful in Him. Numbers 6:24-27: The LORD bless you and keep you: The LORD make his face to shine upon you, and be gracious to you: The LORD lift up his countenance upon you, and give you peace. This entry was posted in Bible Teachings, Inspirational Messages and tagged ark of the covenant, desire for GOd, dwelling place of God, glory, God dwells in us, high priest, holy communion, holy of holies, living in God's presence, manifest presence of God, mercy seat, mishkan, moses knew god face to face, practice God's presence, seek God, seek God's face, seeking GOd, shakan, shechinah glory, shekinah, tabernacle, veil of the temple. Bookmark the permalink. You are welcome and God bless you abundantly as you seek His face and live in His presence. Please pray for a financial miracle for me and my family. Praying for you and your family. God is Yahweh Jireh, The Lord sees and provides.